Heat oven to 350°F. Generously grease and flour 12-cup fluted tube cake pan or 10-inch tube pan. In large bowl, combine all cake ingredients except nuts; beat 3 minutes at medium speed. By hand, stir in 1 cup nuts. Pour batter into greased and floured pan. Bake at 350°F. for 40 to 60 minutes or until toothpick inserted in center comes out clean. Cool upright in pan 15 minutes; invert onto serving plate. Cool 1 hour or until completely cooled. In small saucepan, combine 2 tablespoons brown sugar, milk and 1 tablespoon margarine; cook over low heat just until sugar is dissolved, stirring constantly. Remove from heat. Stir in powdered sugar; blend until smooth. 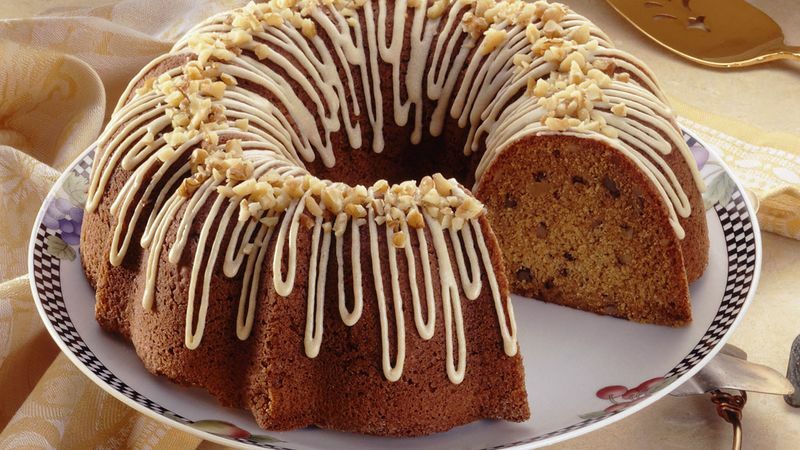 Drizzle over cake; sprinkle with 1/4 cup nuts.